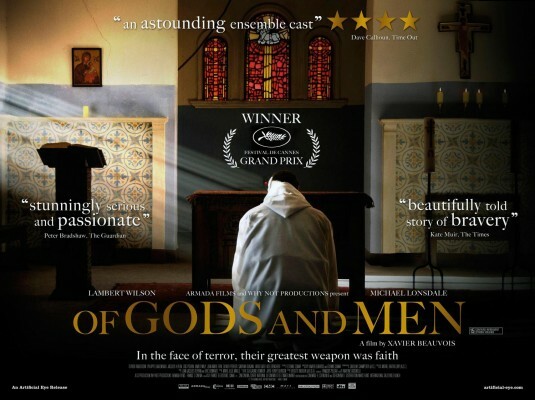 Rumors concerning Of Gods and Men have surfaced all over the place, whether through forums or actual reviews, ever since it lost a nomination for the Foreign Film Oscar. Some critics bemoaned the fact that it was snubbed, as to them it was among the best films of the year from any country. Unfortunately, very few of the films eligible for that Academy Award ever make it stateside by the ceremony, and most audiences haven’t seen or even heard of the victor. But this week, Of Gods and Men finally makes its way onto DVD, and the result is rather astonishing. Here is a film that will go largely unnoticed, yet shouldn’t; a film that few in the U.S. will see, when it should be required viewing specifically to this country. Based on a true story, to which it seems to adhere closely, Of Gods and Men takes place at a monastery deep in the heart of Algeria. The monks, being Christian, are surprisingly at home in the middle of their predominantly Muslim community, and truly seem to act as shepherds, contributing daily to the lives of those nearby. They provide health care, food, clothing and other needs to the locals, and seem to have cultivated a uniquely special relationship with their flock, regardless of creed. Into this peaceful idyll comes violence and terror as a radical group of “terrorists” begin a coup. We watch as some of the locals are brutally murdered, and the monks begin to fear for their lives. When the radicals come to their monastery and demand the use of the doctor, the head monk, Christian, has a discussion with their leader. They will treat wounds, but the monks insist on keeping their land and their people safe from harm. But there is turmoil inside the walls of the monastery, as some of the monks wish to leave before they are killed, and others feel that doing so would be a denial of their faith, as well as a violation of their oath. This is the meaty part of the film, as the monks debate whether they should leave or stay, and what the repercussions of each would be. Would it be an act of strength or weakness to leave? Would they be helping more people by staying alive, or would they be forsaking their flock by running in fear? These are questions that plague each of us every day, if with a little less intensity and significance. Should we seek to protect ourselves, or others? What is selflessness, what is selfishness? Answers to these questions will always be under debate, and how we should act, what particular ethos we should respect, even choosing the clothes we buy (sweatshop manufactured?) are all a part of this deliberation. But perhaps what’s most striking about this film is not the universality of its themes, rather it’s the way the monks and terrorists treat each other. In a scene where terrorists barge into the monastery and a Christian has a sit-down with the terrorist leader, he quotes the Koran to him. But he doesn’t do it to mock or condescend. He does it to extend an arm of brotherhood. Be forewarned: the title is not just a reference to the central monks – it is about belief itself, and what we small men will do for our gods. The monks recognize the fervor in the men opposite them because they possess it, too. The tolerance afforded these terrorists, a word I previously put in quotes, might get some U.S. citizens curious. After all, this year marks the tenth anniversary of the September 11th attacks. But the terrorists in Of Gods and Men are not blind automatons, brainwashed into following the wishes of a madman. Their actions are the result not of a flawed belief system that promotes violence and martyrdom, but of millennia of intolerance on both sides of the conflict. If this film has one flaw, it is that at first glance it can seem slow-moving. From time to time the monks work in their habitual silence, or gaze into the distance appreciating the beauty of the nearby Atlas mountains. But the routines become hypnotic, and you are lulled into a world where you have the chance to truly digest a movie for once, instead of quickly moving from explosion to explosion. You have a moment to think. This film reveals the monastic life in all its glory, in all its faith, and in all its hope. These men wait for their freedom or their death, and they realize that fully. But they choose to stand proud and take whatever is doled out to them. They choose to believe that the best in men still exists. They choose to remain faithful and strong when those words seem to mean less and less. This is a must-see movie, and the clamor surrounding its snub is well deserved. This entry was posted in Reviews and tagged Algeria, Ethical Dilemma, monks, Of Gods and Men, terrorism. Bookmark the permalink.